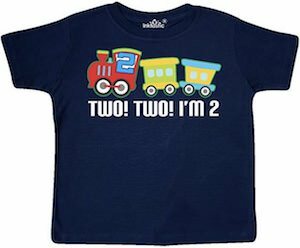 If you child is turning two and likes trains then get them this Train I Am 2 T-Shirt. This fun shirt is available in 16 colors and in sizes 2T, 3T, and 4T and some even have long sleeves. On the t-shirt you can see a train with some passenger carts behind it and then below the train it says “Two! Two! I’m 2” and that is funny as it makes fun for the train sounds. I am sure your child is going to love this t-shirt and wants to wear it the whole year long and will be sad when it turns 3. 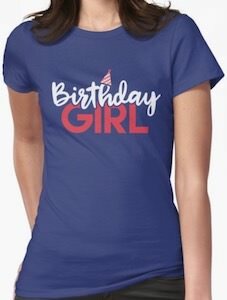 Now there is a festive birthday girl t-shirt you can give to the birthday girl in your life. The women’s shirt is available in 17 different colors and it comes in women’s sizes Small – 2XL and even in different styles. On th t-shirt it says in white and red words “Birthday Girl” and the h has a fun party hat on it. So now you can get this t-shirt as a birthday present as it is the perfect t-shirt that you can make you girl wear on her special day of the year. Get ready for the special day in this fun shirt. If you want to surprise the boy in your life with a fun birthday present then check out this Birthday Boy t-shirt. This t-shirt is available in styles for kids and men and comes in many colors and sizes. 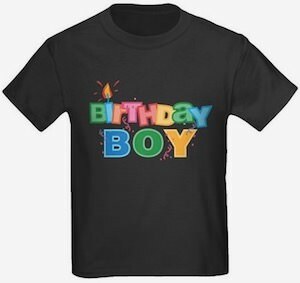 On the shirt it says “Birthday Boy” in big colorful letters and the I in birthday is a birthday candle and around the words you will find more colors full party decorations. So surprise your boy with this fun t-shirt and make them wear it on their birthday so that everyone will know that he is the birthday boy. If you are looking for a fun birthday t-shirt then you have to get this one. 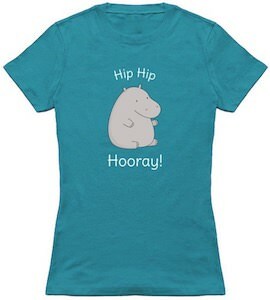 On the t-shirt, you can find a big hippo and around this cute animal it says “Hip Hip Hooray!”. A t-shirt like this is great so you can get one for you own birthday or you can surprise someone with one. 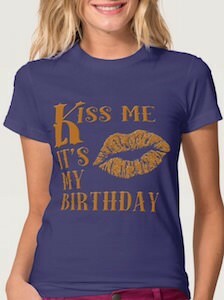 You can get this birthday t-shirt in styles for both men and women in sizes Small – 6XL and comes in many cool colors. Get a funny birthday by wearing this hippo t-shirt so that everyone can smile when they see you wearing this on your birthday. Now there is a fun birthday t-shirt for people that think in emoji. 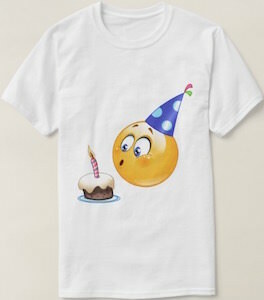 On the t-shirt, you can see a cupcake with a candle on it and a big yellow smiley face with a birthday hat and the smiley emoji is blowing at the candle just like we do on our birthday. So if you want to surprise someone with a funny birthday t-shirt then this is the shirt to get. You can get this emoji t-shirt in men and women’s styles and it is available in many sizes and colors to make it just the way you want. It does not matter how old you get this It’s my birthday t-shirt is just what you need. It’s a personalized shirt so that it has text and your age printed on it. 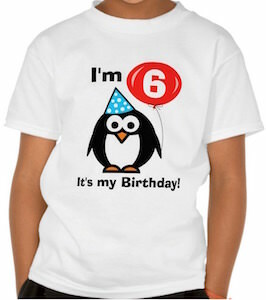 On the shirt it shows a cute penguin wearing a birthday hat and holding a red balloon. In the balloon it now says 6 but that will show your age. And besides the fun graphics it now says “I’m 6, It’s My Birthday” but that text you can change to so that this t-shirt is just what you want. Of course this penguin birthday t-shirt is great for kids to wear on their birthday but is also great for a big boy or girl turning 40 or maybe 80. Is you son turning 4? If so then this t-shirt would be great for his birthday. 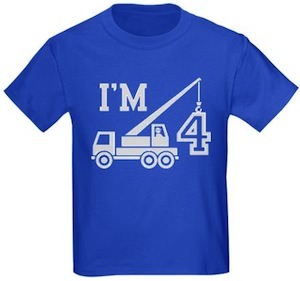 This t-shirt says “I’m 4” and the 4 is hold up by a big crane. So if your kid is in construction equipment then he will love the crane on this birthday t-shirt. And this 4th birthday t-shirt comes in a fun range of colors. Get your kid a shirt he can wear all of his 4th year on this planet. Are you looking for a funny t-shirt for someones milestone birthday? This can be a fun t-shirt to give for any birthday or any other gift giving occasion. 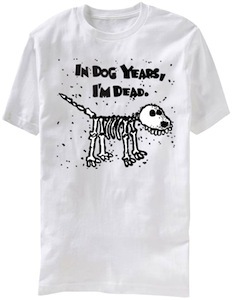 On the t-shirt you see a skeleton of a dog and the text “In Dog Years, I’m Dead.” and you know what they say a dog ages 7 years for each human 1 year. The t-shirt is white and comes in a wide range of sizes in a men’s and women’s version. Mom’s are special and on special days they deserve a special surprise. And this t-shirt can be that surprise. This t-shirt says “Best Mom ever” and yes the shirt comes in different styles and colors. So now you can surprise your mom with a great t-shirt for her birthday, Christmas and of course Mothers day. Get ready to surprise your mom with this Best Mom Ever T-Shirt.